Alejandro “Alex” Nieto, a 28-year-old security guard and devout Buddhist, was eating a burrito on the top of Bernal Heights Park when four police officers surrounded him. They had gotten a call that a Latino man in a red jacket was “starting trouble.” Hands still in his pockets, Nieto was confronted by the San Francisco Police Department (SFPD). The police officers discharged their weapons — 59 shots were fired. The memory of Nieto resonated through the Latinx community in San Francisco. The police were deemed not at fault for the fatal shooting because Nieto was carrying a taser for his job, although this weapon was never discharged or aimed at the police, according to the play. Nieto was portrayed as a gang member and a thug by city officials, both of which were untrue. The community reacted with protests and walkouts. 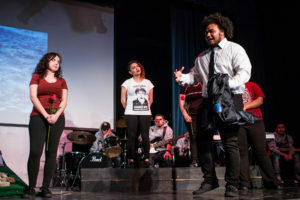 “On the Hill,” a production by the San Francisco theater company Loco Bloco, transformed the Stevenson Event Center on Tuesday night. A prop hill was in the center of the stage as photos of Bernal Heights Park and San Francisco were projected across the backdrop. 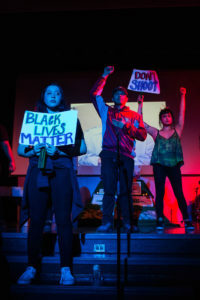 The show, brought to UC Santa Cruz by Student Organization Advising and Resources, Student Media and Cultural Arts and Diversity (SOMeCA), included acting, dancing and music to portray the death and aftermath after Nieto was killed. It showed everything from the anguish of his parents to gentrification in the city to police brutality. The event concluded with a roundtable conversation. Participants discussed their personal experiences with gentrification and police violence and how they identified with characters and narratives in the play. Loco Bloco is made up of high school and college students of color in San Francisco. It intertwines the narrative of Nieto with its members’ personal struggles, which include acting as translators for their family members, fearing police and walking out of school to protest the injustice behind the Nieto case. Herrera-Pazmiño, who is from San Francisco, said she left the city to attend UCSC and then returned four years later to find a different place entirely. Long-time residents are being replaced by an influx of tech workers, which is instilling a sense of change and fear in the Latinx community. In San Francisco’s Mission District, a predominately Latinx community, the Latinx population will fall from 60 percent in 2000 to 31 percent in 2025 if trends continue, according to a study done by the city. As the show closed, the audience gave a standing ovation. When the applause subsided, the audience took their seats, ready to engage in discussion — did they think the portrayal of law enforcement was accurate? What characters resonated with them and why? “We wanted to make sure we were talking about things that impacted different communities and things that aren’t always discussed,” said fourth-year student and event organizer Eron Lake. Student Organizing Leadership Body (SOLB), which consists of student representatives from SOMeCA, produces events and programs like “On the Hill” for the campus community. Lake, a SOLB member, and other students facilitated these discussions. Like members of Loco Bloco, many facilitators had experiences of being racially profiled by law enforcement. “[The discussion] creates a space for students to feel safe to talk about things that are very emotional, shocking, confusing, angry — to have a place where they can […] really learn from each other,” said SOMeCA director Sayo Fujioka. The California State Legislature included $20 million for programming across the University of California system, allowing SOLB and SOMeCA to bring “On the Hill” to campus. The planners hope the event will be replicated and used as a model that emphasizes dialogue and discussion based in social issues that affect the university community. 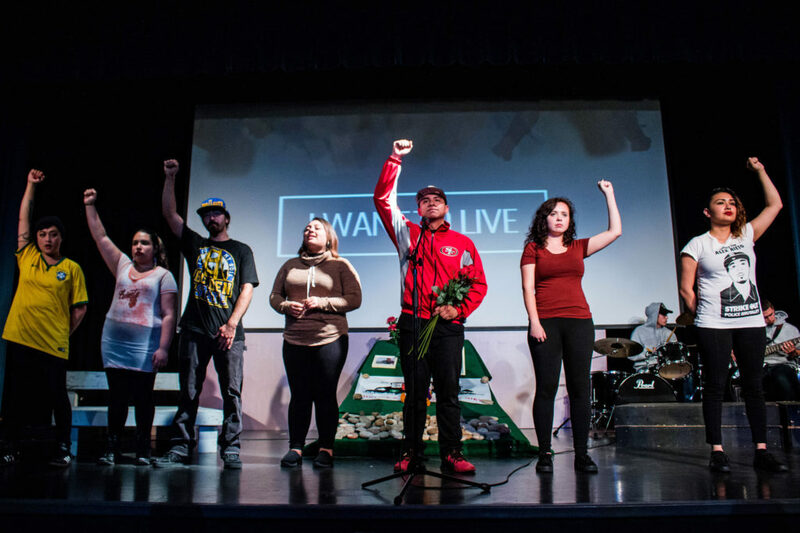 SOLB will continue this event series in spring, bringing a different play to campus that focuses on the struggles of the Black community, with similar topics of police brutality and gentrification.